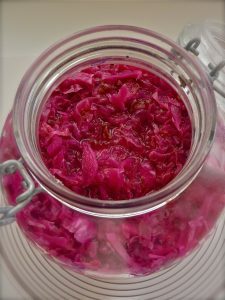 With a small investment in the right equipment, lacto-fermented sauerkraut is easy to make safely and consistently and is a low cost food with a high return on health benefits. NOTE: All of these items, as well as Celtic Sea Salt, can be ordered online from Cultures for Health. Clean and sanitize kitchen surfaces; the cleaner your environment the better. Clean and sanitize the equipment (fermentation jar, weights) to ensure the absence of pathogenic bacteria. Be sure to rinse off the equipment after sanitizing it so doesn’t kill off the beneficial bacteria needed for fermentation. Remove the outer leaves of the cabbage and rinse the cabbage under cold water. Cut the cabbage in halves lengthwise, then in quarters; cut out the cores. Thinly slice the cabbage slaw-style either with a food processor or by hand. Place sliced cabbage in a large, non-breakable mixing bowl or soup pot and add salt and spices for even distribution. Use the kraut pounder to pound the cabbage for 5-10 minutes. Stop a few times to work the cabbage with your hands so the salt and spices are evenly distributed and the cabbage is evenly pounded. You want to weaken the cell structure of the cabbage so it releases its juices more easily with the salt. Pack the cabbage tightly into your fermentation jar; the kraut pounder is handy for assisting with this. Add any leftover juices to the fermentation jar. Add weight on top of the packed cabbage to ensure the cabbage is well submerged in liquid –the anaerobic environment is critical for proper fermentation and preventing contamination. Sauerkraut wants to be suffocated! If the kraut is light on liquid, then add salted water as needed. Over the next 24 hours, the kraut will produce more liquid as the salt pulls moisture out of the cabbage. Tighten the airlock lid and fill the airlock with water to the fill line. Make sure the lid is on tight and the airlock is screwed in securely – we only want gases leaving the container. When properly sealed, the airlock lid makes contamination or spoilage practically impossible. Ideal fermentation temperature is around 68-72 degrees and ok up to 75 degrees. Technically, the kraut is ready in 2 weeks, but is at its best in terms of flavor and probiotic content when it ferments for 3.5 to 4 weeks. More than 4 weeks, the kraut can turn mushy. A little bit of white froth or a white film may form on the liquid surface; this is harmless and will resolve itself. If black mold develops on the surface, then don’t eat it. For information on common mistakes and troubleshooting, read Food Renegades excellent blog on the matter. After 3.5 to 4 weeks of fermentation, move the kraut into quart mason jars, pack it down, top off with salted water as needed, and store in the refrigerator. It’s good for several months. NOTE: If you make batches larger than 5 lbs and the juices overflow through the airlock, it makes a bit of a mess, but it’s harmless and the kraut will be excellent. In such cases, place a pie plate under the fermentation jar to capture the overflow. Liquid overflow will settle down after 7 to 10 days, so you can clean the exterior thereafter while the kraut continues to ferment. In the photo below, the sauerkraut in the front is almost ready for packing into jars. The sauerkraut located behind was just made and you can see the beautiful swirl of green and purple cabbage before it turns pink!